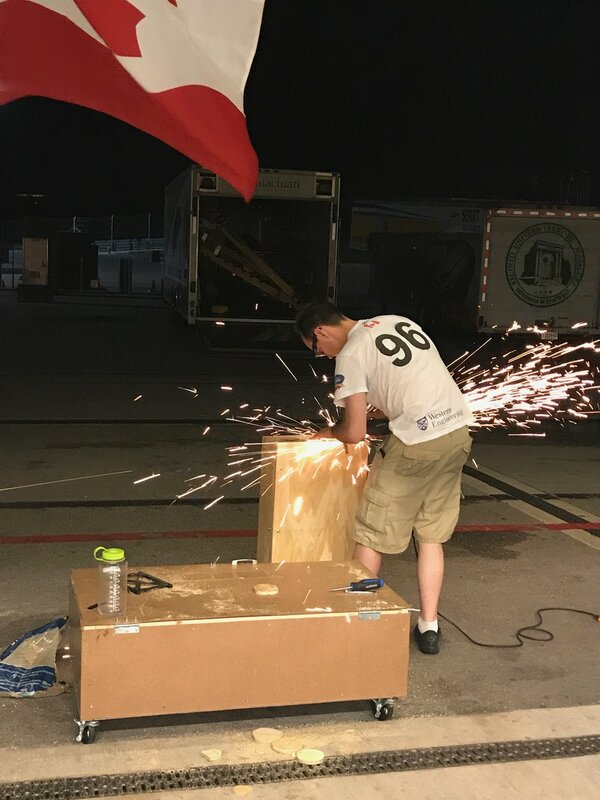 Daniel Woodside, the team's project manager, works on the back-up battery box as the day draws to a close. The team had an early start to the day in order to finish getting the car prepared for dynamics testing. Everyone watched on as Jeremy slalomed down the parking lot and slammed on the brakes for the brake test. While the car was 0.3 seconds too slow in the brake test the team still received blue status in dynamics, meaning the battery protection system (BPS) was all that separated the team from the track although with a 5 lap penalty. Shortly after the team re-tested the BPS and received another green status; finally the vehicle was cleared to race on the track. Excitement was high as the the top of the car was attached and sealed; driver and ballast entered the car; radios were turned on and driver water bottles filled. Just as the garage door began to open everyone realized that perhaps they were all a little too excited. A single switch inside the car had been left un-switched and the top was removed one again. After a thorough check everything was in order the car was sealed a second time. As the door slowly rose and sunlight crept underneath, the suspense of watching the car climb the hill for the first time climbed as well. With Jeremy in the cockpit the car slowly crept up the pit lane, picking up speed faster and faster. Followed by the cheers of everyone watching on the car slowly rose up the hill barely faltering. Where other cars had slowed down to a crawl Jeremy smoothly drove past; cresting the hill and completing SunStang's first lap at the Circuit of the Americas. With a lap time of 5:26 the team had one of the fastest laps of the race so far, a big change from the day before sitting in the garage with the car up on blocks. A second lap quickly followed the first but then disaster struck. With the motor making funny noises at full throttle the car pulled into the pit and couldn't be turned back on. Heading back into the garage the team saw the damage as the battery pack was swung open; a third of the cells were severely under-voltage. All of the damaged cells had to be placed in a salt bath to fully discharge and the team had to move to plan B, the lead-acid batteries. Throughout the afternoon and evening the team has been working to replace systems with new ones for the emergency battery pack. With an extra early start to the morning tomorrow the team is hoping to be back on the track shortly after the race begins for the third and final day. For anyone who is in Austin or the surrounding are tomorrow and is planning on attending the public day we look forward to talking to you and hope you can see our car race along the track along side us!